Alrighty, I’m going to try to make this pretty damn snappy, because I’ve got things to do, so pay attention. I have some shopping I’ve got to get to. Well, not shopping, exactly. Because of course I’m making my presents again this year, but even more so, because of The Economy. We’re all going down the tubes, sayonara, the jog is up, it’s curtains, yes, I’m talking to you, the economical Climate is a not so good. So I’m making my presents this year, because nothing says “cheap” like some awful thing I’ve made on my own in my room. This year it’s pottery, making pottery, most terrible and heinous things that no one could ever want. Last year I made a big point of getting everyone sweaters, which they hated, totally, invariably despised, so, somehow, I’ve got to top that. I’m very excited. It’s going to be an excruciating, urn-filled holiday season for my friends and loved ones; even casual acquaintances will be made more uncomfortable by the hopeless despair that only pottery can offer. Which means I’ve decided to combine my annual godforsaken Christmas Shopping Tips column with my dreaded Year-End Wrap-up column, just in the hope that we can get them both over with faster and I can get back to my kiln. Movies – nope. Lame year. Sorry -unfortunately, no good movies were released this year. Certainly not ten of them. I could shoot for three, or four, maybe. You can probably blame it on The Economy. Oh, wait, I think I thought of some more: “Daywatch”, the Russian sequel to “Nightwatch” (and not quite as great, but they’re both fun); loved “Superbad”, and “Lust Caution” (talk about two movies that are almost identical! ); and “Goya’s Ghosts” (as fevered, wondrous and ridiculous as another old favorite, Coppola’s “Bram Stoker’s Dracula”), “This Is England” (which is probably from ’07), “Before the Devil Knows You’re Dead”, “Snow Angels”, and especially “The Fall” (which is a bit like a darker, more morbid “Time Bandits” in the way it confounds expectations.) OK, I guess I did like some movies. Does that mean I liked some new music, too? I doubt it. I hate music. Wait, though, there were some great songs and ok albums. Old pros Randy Newman (with his new “Harps and Angels”), Al Green (“Lay It Down”), David Byrne and Brian Eno (“Everything That Happens Will Happen Today”), and Bob Dylan (with his new outtakes and rarities collection from the last decade or so, “The Bootleg Series Vol. 8: Tell Tale Signs ”) continued to dazzle, as did intriguing new pros Deerhoof (“Offend Maggie”), the Ruby Suns (“Sea Lion”; their earlier album is swell, too, especially if you love later period Beach Boys), and even Nada Surf (“The Weight Is a Gift”.) I also finally, belatedly got going on Elliott Smith (in particular, an album called “New Moon”), and kinda dug the Dodos and the Teeth; and right now I’m listening to an extremely striking new album called “Mythomania” by a group I’ve never heard of called Cryptacize. So, yeah, again, still some good music. Eleven, again. Wow -creepy. Oh, man, here we go again -I’m out of room, and I’m half way through. OK, never mind; go buy some of these records for people for Christmas, or download ’em or whatever you kids are doing nowadays. Or rent the videos. Or just relax! 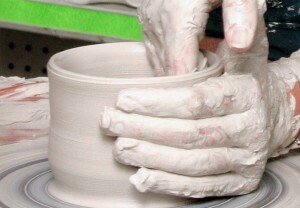 Make some pottery. Scare people. This entry was tagged Al Green, Before the Devil Knows You're Dead, Bob Dylan, Bran Stoker's Dracula, Brian Eno, Cryptacize, David Byrne, Daywatch, Deerhoof, Dodos, Elliott Smith, gift ideas, Goya's Ghosts, holidays, In Bruges, Lust Caution, Nada Surf, Nightwatch, pottery, Randy Newman, Ruby Suns, Snow Angels, Superbad, sweaters, Sweetland, Teeth, the economy, The Fall, This Is England, Time Bandits, Vicky Christina Barcelona, Wristcutters. Bookmark the permalink.